A note on MREs and the like kind. I have had a couple of questions of what I do for food when out on the trail, and as I had the same questions from more than one person, I thought I would stick a page up here with info on it. So, here goes. When planning a trip into the great wide yonder, you need to consider what you are going to do for food. The options you have depend a lot on where you are going, how you are getting to your start point, what you are taking kit wise, etc... But this all said, there are a few requirements you need to bear in mind. Durability - remember the horribly squashed sandwiches you got in school? Ever had a bag of crisps explode in your pack? You need food which is reasonably likely to survive. Effort - having to cook a full blown 3 course meal on a mountain side in a gale isn't fun, ideally you want something you can just eat as is, or with minimal cooking. But not only the cooking, but the cleaning up after should be simple. Nutritious - Mars bars will provide all the energy you need for a trip, but with the vitamins and minerals of a pencil eraser. You want something with balance to it. This goes beyond just a vitamins, but also a balance of carbs and fat for energy, and protein for the muscles. Meals Ready to Eat, are a specific type of meals, originally of US army origin, that self heat (add water, leave to stand for 15 mins, eat), that can be eaten cooked or cold. They are light weight, relatively durable, and easy to prepare. Also in this category are things like the Wayfarer backpacking meals, and Rat Packs (British army 24 hour ration packs). Of all of these the British rat packs are the most appetising and the best value for money. (I won't go into detail on them here, there is plenty of info out there on the subject.) 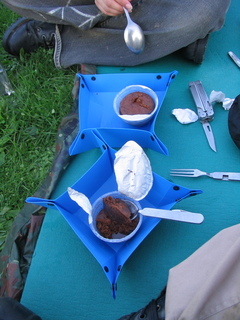 MREs, Wayfarer meals and the such likes, don't score very highly in my opinion. They offer quite a limited menu, and those they offer are not my sorts of food. They are also very expensive. Having spent most of the past few years as a poor student, they are not a great option. As such, I do not recommend them. The number of calories you consume in a day out on the hill is very different from what you will consume sitting in an office. A quick Google, and you will find many sites giving you various values for how many calories that great "average person" consumes performing a given activity. In general tho, they all agree that sitting at a desk doing office type work you will consume about 100 calories an hour. That's roughly equivalent to a slice of bread. Walk at a moderate pace for an hour and you are going to be pushing the 400 calories mark. Stick a pack on your back, drop the temperature, and you can easily ramp that up to 500. As such, when you are hiking for days on end, you can easily push 3000 calories a day. Without doing anything massively strenuous. With this in mind, you need to make sure that your day's food intake can provide most, if not all, of what you need. Now if you are trying to lose weight, you will probably want to have a shortfall on the above count. But, and I can't stress this enough, not by too much. One pound of body fat is approximately 3500 calories. Doctors recommend you don't lose more than 1-2lb a week, so you don't want to fall short of what you consume by more than 500-1000 calories. What you don't want to happen is get stuck out on a hill with very low blood sugar and not enough energy to get home. Mountain rescue won't like you if you do. I cannot stress enough, the importance of water while hiking. Dehyration can be a killer, and should be avoided at all costs. No matter how much water you think you will need for the day, take 50% more. I carry at a minimium 2x1L water bottles, sometimes 3 (in hot weather), and will replenish them at every opportunity. So don't spend days preparing a gastronomic delight to enjoy atop that Munro, and forget to take plenty of drink too. And while you are at it. Try to avoid caffinated drinks like tea, coffee and coke. Also alcoholic drinks too. These encourage dehydration, not good. The humble Mars Bar I have found through rigorous experimentation to have the highest melting point of any chocolate bar, and even when it starts to go soft it remains edible and maintains structural integrity. I carry these on all but the hot summer trips. 280 calories a bar. Great. Fifty calories a piece, relatively light weight, quite durable (just don't drop em), and easy to eat while walking. I prefer these to both of the above for all round use. In all bar the hottest weather they will keep for days on end if you pick the right kind. Good source of vitamins too. Whilst not something I personally like, Kendal Mint Cake is a firm favourite amongst hikers, high in energy, tasty (not my taste, but hey), quite durable, and doesn't melt in summer. For a day hike, the options that are narrowed down somewhat. Usually you just need something for a lunch on top of the hill, and maybe a few snacks along the way. As such, I usually just go for a couple of sandwiches or rolls. Cheese, ham and salad sandwich covers most of your food groups, happily. Add a Mars Bar, and apple, and maybe a pack of crisps and you are away. If it is cold I will usually take a thermos of hot soup. I try to avoid tea and coffee on the trail as it will only dehydrate you, which is not a good thing. Don't forget to have a decent breakfast before you go. A slice of toast and jam won't do it. When you have a few days to take food for, you need to start thinking about more than just a single meal. You now have breakfast, lunch, and dinner to cover. However, you also have the time element to consider. You don't need to eat the same types of foods across every day. Day one, and breakfast of day two, you can get away with taking fresh, or frozen foods without worrying about them going off, as long as its not the height of summer. Various other semi-preserved foods will last 'til at least the evening of day 2, if not 3 (depending on weather). This means you can stagger nicely. It does however mean the food gets worse as the trip progresses. Either as a vac packed item from wayfarer, or as a tin from Tesco's, sausage and beans is a good staple. You can eat it cold, but its *A LOT* nicer if you warm it first. If you go the tinned route, you can find various other beans and ... combinations. They also come in half sized tins if you are out on your own and don't want a whole tin. If your taste swings that way, oatmeal is a good option, quite light, very easy to prepare. Relatively healthy. Search long enough in your local Sainsbury's you will find they sell a few Long life meals, one of which is a bacon and potato meal. It has a shelf life of 5 years and comes sealed in a large silver packet. They do feed 2, so are better when you aren't on your own (or you have a large appetite.). But if you fry them for a couple of minutes, they are edible enough. Not as good as a real fry up, but good enough. Lunch follows a similiar pattern to breakfast, starting fresh and getting less so as the trip goes on. Day one you can get away with a nice crusty roll with a fresh filling such as a meat or cheese. But this won't keep well to day 2. However, the roll probably will do till day 2, if not day 3. From day 2, I can recommend jam. You can get it in small one person packs which whilst marginally heavier, they will stay fresh no matter the temperature. And are still edible. Having cooked breakfast, if you stick a pan on to boil water while you eat it, you can then make a some soup up with the boiled water once you have eaten. Stick it in a thermos and you have lunch ready. Especially if you can carry some crusty rolls for the first days. I tend to use either Cuppa Soup, or if there is 2 or more of us, then you can get packs of soup mix which generally serves 3-4. In most supermarkets you can get a half size tin of stewed steak, which comes in gravy, pre cooked, You just need to heat it up. 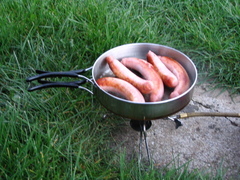 Which you can do directly on a Crusader Cooker without having to stoop to pans and the such. Again couple with something carb and starch based like a roll. Yet again, starting fresh and getting less so as the trip progresses. 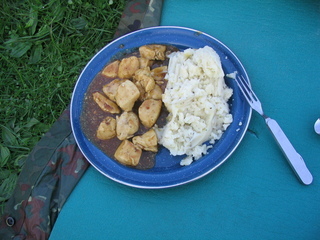 Chicken stew with mashed spuds, served on a campsite somewhere in the depths of the kent countryside. Stir till the stock cube has desolved. Stiring gently, add some gravy granules, mix chicken with vegetable at a ratio of 3:1 for a slightly nicer flavour. Make sure the gravy granules disolve fully. Serve when chicken is cooked through. Goes well with either boil in the bag rice, or instant mash. Having tried all the options for mashed potatoes, I found that Sainsbury's instant mash was the nicest option. However they "improved" their recipe about 2 years ago and it wasn't as nice any more. Of all the others, Tesco's own brand isn't to bad, but MASH is the nicest as long as you are *very* careful when preparing it. Adding milk powder can improve both. Following the method outlined above but rather than using frozen then defrosted chicken, I use freeze dried chicken, which can be bought from various places. Its not quite as nice, but isn't that bad either. What I tend to do for this one, is mix all the ingredients together dry, and seal in a ziplock bag, just add to boiling water, stir for a few minutes, and away you go. The same long life meals as recommended for breakfast work very well for main meals too. Batchelors Beanfeast are a good choice for the backpacker. They come in pouches that you add to boiling water, boil for about 20 minutes and serve. They come in 5 different kinds and don't taste too bad. Better yet they are entirely soya based, and are entirely vegan (good choice for the vegetarians out there). They go well with instant mash, or pasta, or even boil in the bag rice. The one downside of them, is they are very low in calories at around 200 per serving. But at just 65g per pouch, you can take 2. For all the above choices, I find myself tending towards tinned foods for my trips. They come in handy sized portions, they are very durable, and last forever, I also don't have to worry about temperature. Their main downside is that of weight, but in the long run you have to carry the liquid to rehyrdrate meals anyway, so you may as well carry it in the food. Not only that, you know they aren't going to go off. I especially like the half sized tins of steak, as they cook in minutes on a crusader and require no washing up. Tins also win out on the sheer variety available. They are also a nice size for the PLCE webbing pouches that I use. Meaning I can fit about 2 days worth of food in a single pouch. Whilst not something I like at all, I know many hikers who find that Pot Noodles, and/or Supernoodles to be exellent trail food. In fact Ray Mears has in interviews confessed to finding pot noodles to be one of his favourite things to eat on the trail. Not my thing though. Some people like them and no article on hiking food is complete without at least mentioning them. You can get microwavable puddings in most supermarkets which come in small plastic pots about 2.5 inches across. Whilst they are intended to be microwaved they also work very well when placed in a pan of boiling water for 15 minutes. I put them on while I eat the main course, and by the time I am done, they are cooked. They come in a variaty of flavours are lightweight, and very cheap. For trips upto 4 days in length the above holds true very nicely. However, as trips get longer, you need to put more care into the food, not only in the variety, but if you are going for say 1 week without resupply, then its going to get very very heavy taking tins. At 400gm a tin 2 weeks worth at 1 tin a day is 5.6KG, which by the time you add breakfast, and lunch as well you are looking at 10+KG. However, if you mix in some bean feast, and maybe a couple of freeze dried stews, you can get the whole lot down to 5KG for 2 weeks, plus water. Which is wholely more bearable. This said, I suggest that for trips of 7+ days you think about ways to do resupply enroute. Hiking is supposed to be fun, lugging that much weight on top of all your normal kit for 2 weeks is not going to be as enjoyable as if you reduce the weight a lot. Not to mention the fuel required to cook it all. This page last modified Wednesday, 15-Sep-2010 13:47:56 CEST.